Male grooming is something that I have never really featured on my blog before, but it is definitely something that should play a huge part in the life of pretty much every male out there, as I think it is so important to look after your skin and body, you only get one after all! As someone that tends to use the gym an awful lot, I find that I require good quality products which enable me to feel refreshed and replenished as well as leaving me smelling sweet after a gruelling workout for a reasonable price in order to fit within my student budget. I was really excited to be approached by Scaramouche & Fandango, who specialise in male grooming products, to review a couple of their products and kick start male grooming onto my blog! Package design and branding is essentially one of the most important aspects of a grooming product in my opinion, being the eye catching quality that tempts you into plucking it off of the supermarket shelf or standing out from the crowd in a saturated online store. One of the problems that I usually have with male products is the busy and overcrowded look of packaging, leaving you hunting for exactly the type of product that you need in a sea of products that tend to look very similar. Designs tend to be complex and the choice overwhelming, with so many different ingredient combinations all promising to solve every problem under the sun, which is why it is so exciting for me to find a brand which focuses purely on the simplicity of high quality skincare and body products while maintaining a slick and professional look. The Scaramouche & Fandango design particularly appeals to me as de cluttered, simple and easy to distinguish between the different types of products. I love the letters on the front of the bottles which, being a complete science geek, totally remind me of the periodic table element symbols *nerdgasm*. The minimalist design and big lettering also makes it easier to find the product that you need when you're looking to have a quick shower without fumbling around looking for the shampoo with soap in your eyes, a problem that I experience all too regularly. Scaramouche and Fandango pride themselves on providing high quality British made products and having experienced them myself, I firmly believe that they do deliver this promise. It is important for me that any product that I use is effective, affordable and the ingredients are as natural as possible and in no way tested on animals, so it's always good to find animal friendly brands such as this one. 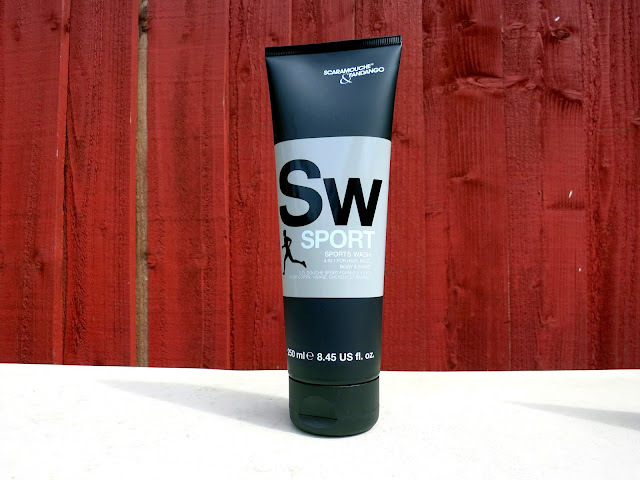 The Sports Wash is a fairly reasonable £9 for 250 ml, especially since it is a versatile 4-in-one hair, body, face and shave wash. saving you vital pennies from having to buy four entirely different products. Sometimes, the down fall when buying an all-in-one product is that it can be effective in some areas but lacking in others or it could be average in all areas, which is why I was quite impressed with how well this sports wash works as a shampoo, body wash and face wash. Plus, it smells absolutely amazing which is helpful to eradicate that post gym smelliness! The Face Scrub is a little more pricey than the face wash that I would usually opt for at £8 for 100ml. I am one of those really self concious people about my skin, especially my face, so face washes and scrubs are something that I am willing to spend a little more money on as long as I can see the positive benefits. I am not the biggest fan of face scrubs as they always seem to end up drying out my skin and leaving me red in the face. I found that the micro beads within the face scrub from Scaramouche & Fandango are a lot more gentle on the skin while still leaving it feeling smooth and fresh after use and also leaving my skin much more blemish free compared to other face scrubs that I have experienced in the past. After around a week of once a day use, I have barely made an indent in the contents of the tube (I am rather conservative though) so I really do think that you get your money's worth in terms of quantity with this product. As a student, the only slight negative with the products from Scaramouche & Fandango for me personally is the price. Although I can totally justify spending the money for the impressive benefits and quality of these products and think that they are excellent value for money compared to other higher end brands, I don't think that I would be able to afford to purchase the products weekly/every other week, so I see them as more of a great birthday or Christmas present, a little treat every so often to indulge myself or a way of changing things up when I get bored of my same old routine. 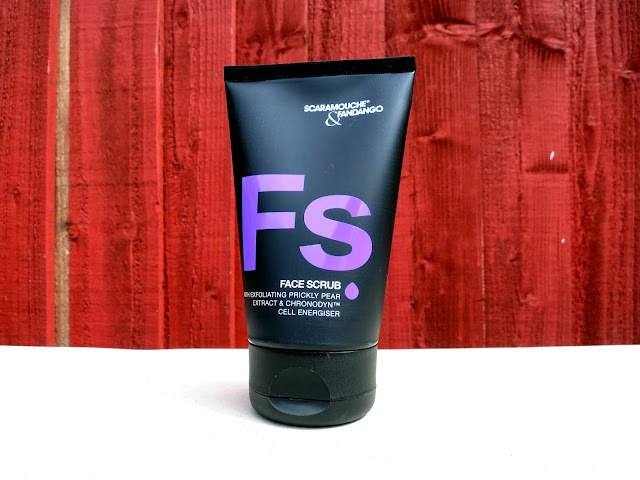 Overall, I would recommend giving Scaramouche & Fandango a try if you are looking for an effective and simplified range of high quality male grooming products from a quirky new brand! If you would like to check them out for yourself, you can find their website here. the packaging is certainly manly :) this is a cool post! I don't see many product reviews for men..